This Universal External Lithium Rechargeable Battery Pack is the Solution for You. In most case, it can double your laptop running time together with your internal laptop battery. For some small netbook computers, it may even triple the running time. Universal External Rechargeable Battery - BP90. 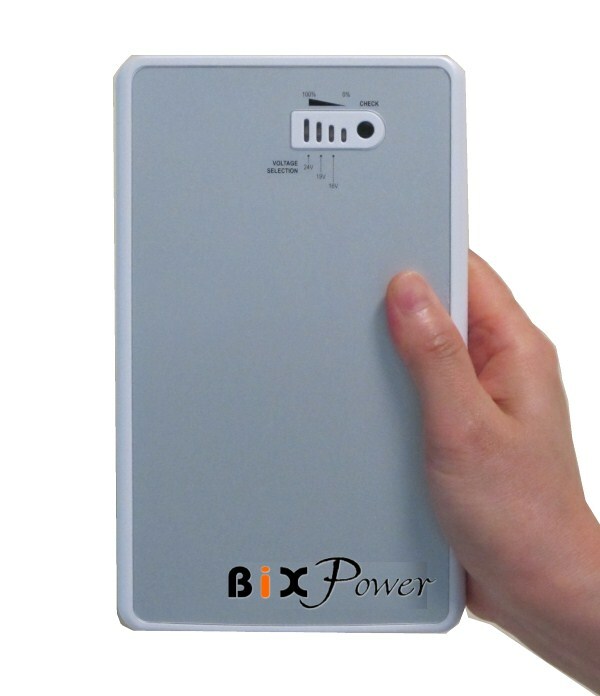 High capacity: This battery capacity is 96 Watt-hour ( or 26000 mAh). 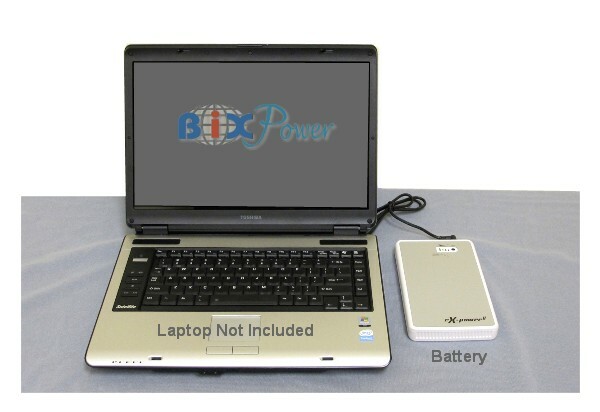 This Universal External Lithium Rechargeable Battery Pack can provide power for laptop computers, digital cameras, digital photo frames, PDAs, cell phones, DVD players, etc. Output I is a 5V USB port that can be used to power or charge cell phones, iPhone/iPod/iPod Touch, MP3/MP4 players, PDAs and any device that can be charged from a USB port (USB power cable not included). Output II has a nominal voltage of 11.1V (Range from 9V ~ 12.6V). This port power comes directly from battery cells without voltage regulation. When the battery is fully charged, its voltage is 12.6V. Output voltage will then decrease gradually. Most of the time, the output voltage will be around 10V ~ 11V ( nominal voltage is 11.1V). When the voltage drops to 9V, the port will shut off and stop providing power. 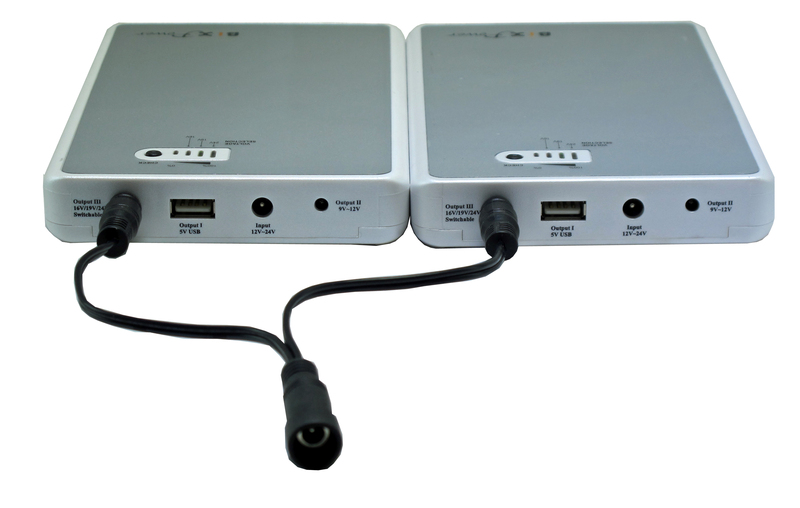 This port can be used to power portable DVD players and digital photo frames. Output III can output 3 different voltages: 16V, 19V, 24V. 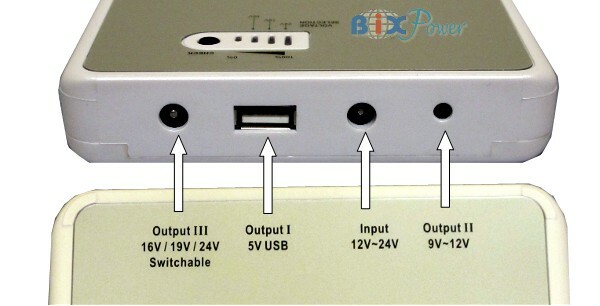 This port can be used to power many different laptop notebook computers and other electronic devices that require stable voltage. With optional different connector tips, this battery can be used to power or charge many different laptop computers. This battery's capacity is 96 Watt-hour. In most cases, it can double your laptop running time together with your internal laptop battery. For some small netbook computers, it may even triple the running time. 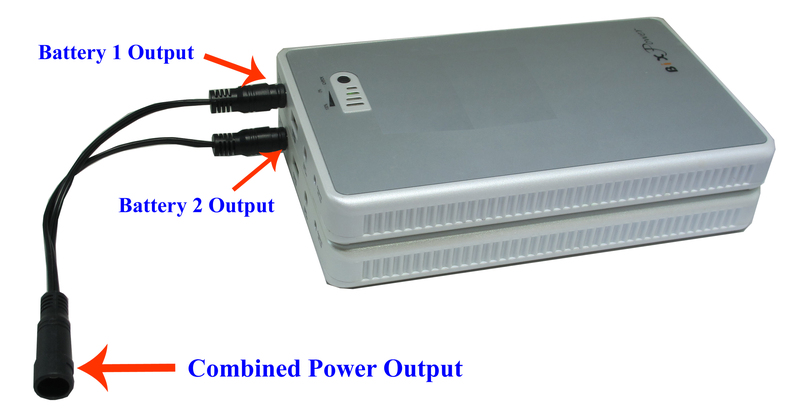 This battery can be charged from any 12-24V DC power source. It can also use your current laptop AC power adapter as a charger if it has a 5.5 x 2.1mm connector. Port I and Port II can use optional connector tips at Consumer Electronics Plug Tips. 1. 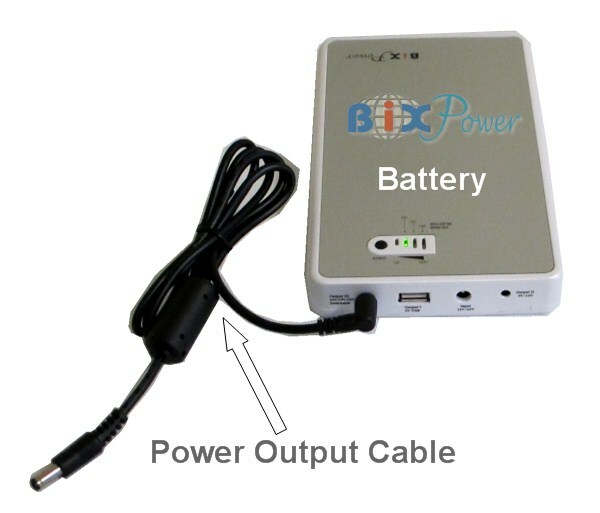 Charge the battery: The battery's AC charger can use any 100-240V 50Hz/60Hz AC power source. You can also charge the battery from a car cigarette lighter socket with a car charger, or use solar power with a solar panel. 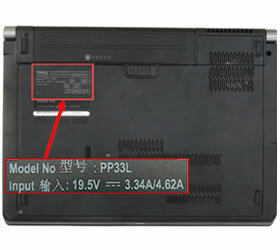 Refer to the label stuck on the bottom of your notebook - to check the "power input" requirement. There are 3 LED lights to indicate port III output voltages. When you plug the output cord into port III, one LED will light to show you the current active output voltage. 2. Press and hold the "CHECK" button for about 3 seconds. 3. One of the LED indicators will begin flashing. This shows the port's current voltage. 4. 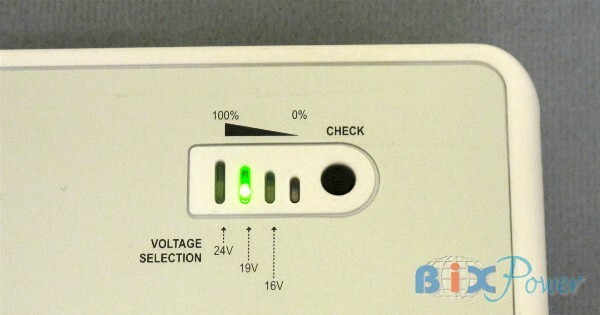 Press and release the "CHECK" button, the flashing LED will jump to a different voltage. Continue to press the "CHECK" button until it jumps to the voltage you want. The port III output voltage will be locked after the output cable is plugged into the port. This will prevent the output voltage from being changed accidentally during the use. 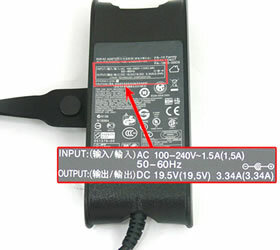 To change the output voltage, please remove the output cable from the port first and then repeat the above procedures. 3. According to output voltage, select Output Port and Connector Tip. Port III: 16V ~ 24V DC output port with Output Cable Z6. The default battery output cable and connectors are configured as positive polarity, which meet the needs of most of devices. You may also use multi Y25 Split Connector to Daisy Chain more batteries to provide even more power. Please make sure all batteries output voltages are set at same. Fully charge each battery separately before connect them together.